The object of much debate, attention, and scholarship since it first aired over 20 years ago, ""The Simpsons"" provides excellent, if unexpected, fodder for high school and college lesson plans. There are many benefits to using ""The Simpsons"" in the classroom, the most obvious of which is that it's funny. After all, laughing students are hardly sleeping students! 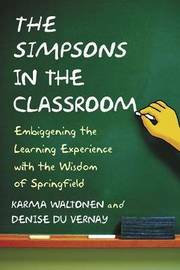 But ""The Simpsons"" also provides a familiar student knowledge base which instructors can use as a jumping-off point to introduce concepts ranging from literature composition to linguistics, the humanities, cultural studies, gender studies, and media appreciation. The authors, both of whom have been teaching ""The Simpsons"" for over a decade, share exercises, prompts, and even syllabi that have proven successful in their own courses.